That was quick. 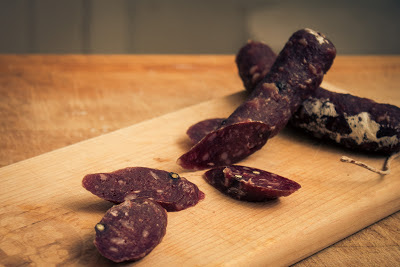 My grass-fed beef salami has dried and is ready to eat. They cured much quicker than expected, which I attribute to their leanness. With so little fat, the salami was able to quickly and evenly dry. So texturally, these beef salami are very dry, but I find it’s actually a pleasing chew rather than a hard, leathery toughness. They were gently seasoned with garlic and black pepper, but the primary flavor to come through is a savory, beefy flavor. There is a bit of a “tang” in the finish, which I attribute to the type of starter culture I used in inoculating the meat. I’ve been using F-RM-52, which can produce a good amount of lactic bacteria and give a tangy “summer sausage” type flavor. I haven’t noticed it too much in my pork salami, but it was definitely noticeable here. Moving forward, I’m going to be working with a much milder starter culture, T-SPX, which promises a milder acidity and a more aromatic profile. I’m hoping this will get me closer to recreating the gold standard of American salami, Fra’Mani Salametto, which is just unbelievably perfect. Plus, T-SPX should minimize the acidic tang found here. One thing you might notice is the sporadic white mold on the salami. That was the mold I inoculated the casing with, in an attempt to have the traditional coating and look. For Christmas Carla’s brother gave me a copy of the Marianski’s Home Production of Quality Meats and Sausages, which is incredibly informative. This book suggests my lack of full coverage is probably due to the quickness of the sausage drying. A small diameter combined with a low amount of fat made these sausages cure quickly, but the rapid drying quickly robbed the mold of its moisture, rendering it inert. That would explain why I had such great mold growth for the first 5 days, then it ceased completely by day 7. Well, regardless, time to eat!